Is there a more ideal food to prepare in winter than a warm bowl of soup? It's a wonderful way to turn canned and dried ingredients into something delicious during the time of year when fresh produce is scarcest. It can warm you up when it's cold outside. It's easy to share, perfect for leftovers and, when making family recipes, even brings back memories. What makes a winter soup? Well, soups that rely on fresh summer produce like corn and tomatoes are out. And cold soups aren't very wintery either. But after that, I think most soups would be welcome during the cold months. 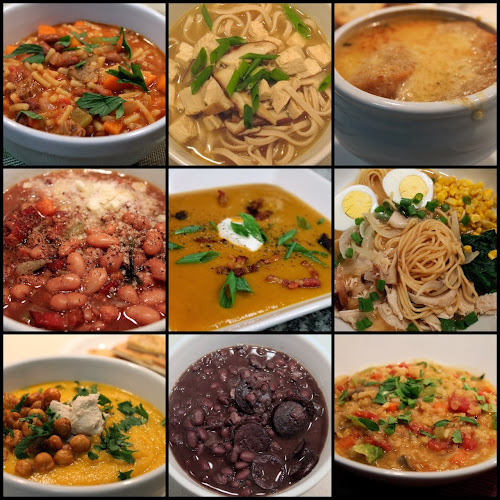 Bean or legume soups are a particular favorite of mine. Black beans are my favorite, such as the Basic Black Bean Soup or Black Bean and Butternut Squash Soup. One of the best soups I've ever had is this Smoky Pinto Bean, Red Wine and Bacon Soup. While fresh pea soup may reign in the spring, in winter Split Pea Soup with Ham is a delicious classic. Navy Bean Soup with Kielbasa and Homemade Vegetable Stock is a versatile way to make interesting bean soup. Soups, or rather stews, can turn tough cuts of meat into something delicious, like this wonderful Beef Stew in Red Wine Sauce. A good Lentil Stew is a winter must as well. Winter and year-round vegetables makes wonderful soups, many of which are vegetarian. Butternut squash, especially pureed gives soup great body, like in this Smoky Butternut Squash and Apple Soup. French Onion Soup is a particularly good way to warm up on a cold day. Parsnip-Carrot Soup with Tahini and Roasted Chickpeas is perfect if you love hummus. Apple-Fennel Soup with Beans and Sausage pulls together a lot of interesting flavors. Carrot-Sweet Potato Soup with Bacon or Sweet Potato Soup with bacon and Chives both use ingredients you can generally find year-round. Lastly, noodle soups rule in winter, such as Asian style soups like Chicken Miso Ramen and Chicken-Udon Soup, or the Italian favorite, Pasta e Fagioli. Soup Week -- hooray! I'll eat your soups any time of year. This is right on point!!! Thanks Jessica. It's definitely a hot soup day. I went out for Chinese roast pork noodle soup for lunch today. It hit the spot.